A bright, white smile is readily attainable now as techniques for whitening teeth have become more advanced and easily available. Alita Dental offers two types of whitening treatment: at-home and in-chair. The first step in any whitening treatment is to have your teeth professionally cleaned, which removes any built-up plaque and calculus deposits. For at-home whitening treatments, we will take an impression of your teeth during your initial visit and use the impression to create custom whitening trays. Once these trays have been made, you will be supplied with a take-home whitening kit that includes the trays and a whitening gel. The gel we supply you with has a greater concentration of whitening agent than a store-bought kit. You will apply the gel to the inside of your trays and then wear them for a few hours each evening over a period of a few weeks. If you find that your teeth become more sensitive during the whitening process, you can stop for a few days or use a desensitising product between whitening treatments. If you want instant gratification, you can choose an in-chair whitening treatment that takes about 90 minutes and provides dramatic results. During your visit, your dental professional will protect the surrounding gums and soft tissue with a protective material before applying a professional strength whitening gel to your teeth. We will then use a high intensity light to activate the gel and make several passes with the light to ensure a whiter, brighter smile. We will also take impressions and produce whitening trays for you to use whenever you wish to brighten your teeth in the months after your in-chair whitening treatment. A whitening treatment can last for anywhere from 4-12 months, depending on your diet and how often you perform your whitening maintenance. Veneers are used to improve the appearance of a tooth by covering the front surface that may have been damaged by chipping or staining with a custom porcelain overlay that is coloured to match your existing teeth. We also use veneers to close gaps in teeth and straighten teeth that are crooked. Once the surface of your tooth has been properly prepared, we bond the porcelain veneer into place to affix it permanently to your tooth. 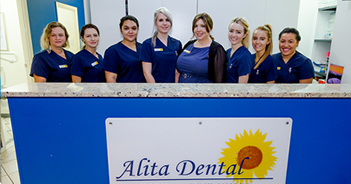 Experience the Alita Dental difference with pleasant dental care. Contact us for your next appointment.